Michigan Farm To School - Blog: FW: 2018 USDA Farm to School Grant RFA Now Available! FW: 2018 USDA Farm to School Grant RFA Now Available! Please see more below about the USDA Farm to School Grant RFA that is now open. Applications are due on December 8! Subject: 2018 USDA Farm to School Grant RFA Now Available! The USDA Farm to School Grant Request for Applications (RFA) is live! Please spread the word far and wide that folks may now apply for the $5 million available in grant program funds. What: USDA Farm to School Grants of up to $100,000 for planning, implementing or training on farm to school programs. Who: Schools, non-profit organizations, state agencies, Indian Tribal Organizations, farmers and other eligible groups may apply. number of planning and implementation awards. • Applications from Indian Tribal Organizations and entities serving Native communities. • Applications from state agencies (i.e. the state agency is the lead applicant). • Projects that reach more than one school. • Projects that serve a high proportion of children (at least 40 percent or more) who are eligible for free or reduced price meals. Why: The purpose of the USDA Farm to School Grant Program is to assist eligible entities in implementing farm to school programs that improve access to local foods in eligible schools. Thank you for your help assuring that we have lots of great applicants from the Midwest Great Lakes Region! Please feel free to forward this email to interested applicants and regional partners. Sign up for our E-letter for updates about grants, news, resources, and more! 2018 Farm to School Grant RFA is Now Available! October is here and it is time to celebrate everything we love and know about Farm to School! From taste test to farm visits, to buying local foods and training farmers and producers, farm to school supports our local communities. This October, the Office of Community Food Systems is excited to release the FY 2018 Farm to School Request for Applications (RFA). How are you celebrating National Farm to School Month? Using social media to share your Farm to School Month activities? If so, use #farmtoschool and #F2SMonth. We want Farm to School to trend this October! This webinar is part of a wider effort to promote the release of the associated report "Economic Impacts of Farm to School: Case Studies and Assessment Tools" (a collaborative project of the National Farm to School Network and Colorado State University). Panelists will discuss findings of the new report, highlight the use of two key resources for conducting economic impact studies of food system initiatives and their application to farm to school economic impact assessment, and discuss continuing work to better understand the impacts of farm to school activities. The Value Added Producer Grant (VAPG) program helps agricultural producers enter into value-added activities related to the processing and/or marketing of new products. The goals of this program are to generate new products, create and expand marketing opportunities, and increase producer income. Applicants may receive priority if they are a beginning farmer or rancher, a socially-disadvantaged farmer or rancher, a small or medium-sized farm or ranch structured as a family farm, a farmer or rancher cooperative, or are proposing a mid-tier value chain. Summer meals may be over for 2017; however, fall is the perfect time to start planning for next year's success. This webinar discusses best practices and strategies for collaborating with SNAP-educators and farmers markets to enhance your meal program with local foods and engaging activities. National Farm to School Month Spotlight! Whitsons at York Suburban School District Supports Farm-to-School with Fun Activities for Students! 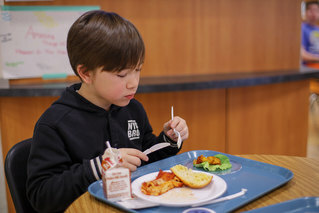 Earlier this year, York Suburban School District received a farm-to-school grant from the Pennsylvania Department of Education Division of Food and Nutrition. 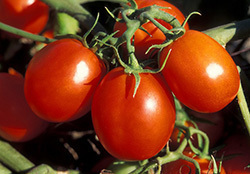 The purpose of the grant is to provide students with access to fresh, healthy food sourced locally, and to implement farm to school activities such as: student taste-test of local products, farm-related field trips, school garden activities, and efforts to incorporate local products in school meals. Helen Heidler, Food Service Director for Whitsons Culinary Group at York Suburban School District, explains that the grant was written to support three local vegetable tasting events that took place last school year. Where have you Bean? - Featured different types of beans. Lettuce Entertain You! - Focused on a variety of leafy greens in a chef-created lettuce wrap. We are Rooting for You! - Introduced students to different types of root vegetables. Once students tried the food samples, they were given a sticker and were encouraged to place it on the "I tried it" board to indicate if they liked it, loved it, or it's not for me. Students enjoyed this activity because it allowed them to try foods that they may not have tried or even seen before. 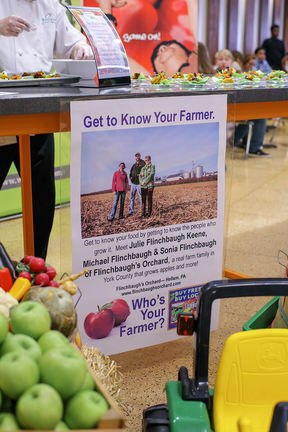 Local area farmers from Flinchbaugh's Orchard, Miller Plant Farm, and Brouge Hydroponics were invited to attend the events and provide information about their farms along with nutritional details, which were on display in the cafeteria for students to review. This year, plans are underway to partner with Brown's Orchard, a local family orchard that has a pit master. The pit master will bring his smoker to York's secondary schools and prepare fresh pressed apple cider infused pork, prepared on smoked apple wood from the orchard. Several fresh apple varieties, as well as some garden fresh grilled and roasted veggies will also be served. Helen and her team partner with York County Buy Fresh Buy Local and the York County Food Alliance each year to plan amazing events for National Farm to School Month!